Are You Taking Your Faith With You? I went on to explain that I can no more separate myself from my religious beliefs than I can from my skin color or height. My faith in Jesus Christ is not my grandparents’ religion or a collection of stories. It is what forms my worldview and governs my decisions; it is the needle on my moral compass and the most important determining factor in my life. Some may scoff at this, or invoke the separation of church and state, but I would point out a few things. First, having convictions is a good thing. People are sick of politicians who move whichever way the winds blow. I will never do that because my beliefs won’t change. I’m not running to build a political career and do what is necessary to stay in office. I’m running to make a difference and do what I think is right. Second, my convictions make me a better person. My theology says to love my neighbor as myself, to pray for my enemies, to do good to those who curse me—why would anyone want me to leave that home when I go to Columbia? Finally, I would point out that the “leave your faith at home” mindset only applies to Christians. 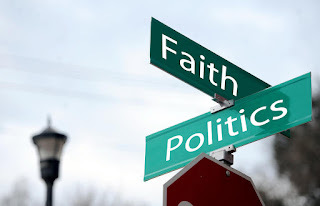 Atheism is a belief system, but secularists never say, “I hope you leave your atheism at home.” In fact, I would submit that atheism in the workplace and in government is what has led to the moral decline in this country. If anything, we need more people to take their Christian convictions into government. I don’t want to be a congressman who happens to be a Christian. I want to be a Christian who happens to be a congressman. This is who I am. I would love your vote, but I won’t compromise to get it.